Desmoid tumor is neoplasms originating from the musculoaponeurotic structures throughout the body. The term desmoids, coined by Muller in 1838 was derived from the Greek word desmos, which means tendon-like. A synonym for desmoid tumor is fibromatosis. They are usually well differentiated, overgrowth of fibrous tissues that are locally aggressive with negligible metastatic potential. Desmoid tumors account for 0.03% of all neoplasms and 3% of soft tissue tumors. They are seen more commonly in females than in males with a male to female ratio of 2:1 and in the age range of 25–35 years. In 2%–15% of cases, desmoid tumors can be associated with familial adenomatous polyposis (FAP) and are usually located in the small bowel mesentery. Approximately, 3.7 new cases occur per one million persons per year and develop mostly as an extracolonic manifestation of FAP. In the etiology of the tumor, mutations in either the β-Catenin or Adenomatous Polyposis Coli (APC) genes are usually responsible for the development of the tumor with the former comprising the sporadic development while the latter is associated with FAP syndrome. 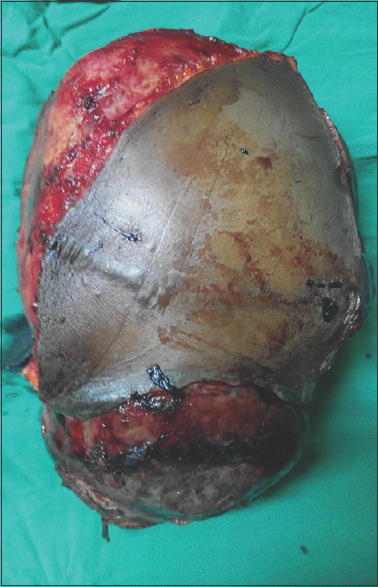 We report a case of extraperitoneal desmoid tumor in a 24-year-old female who had complete excision of the tumor for over 6 months without tumor recurrence. The aim of the case report is to highlight the rarity of such tumor and the role of complete surgical excision in preventing early recurrence. 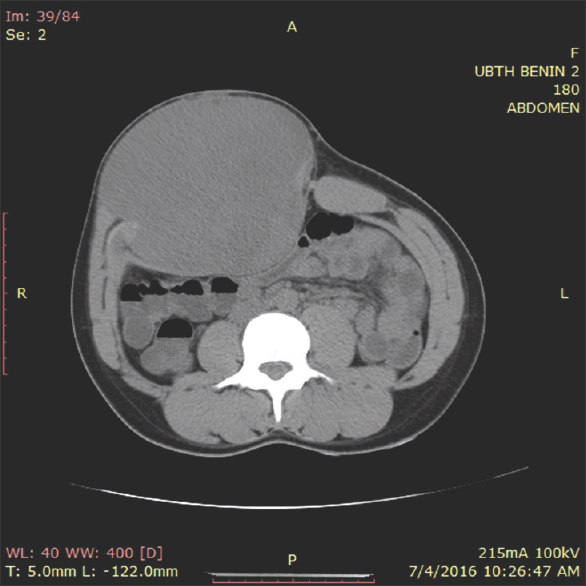 A 24-year-old female presented with a recurrent anterior abdominal mass for 6 years. The mass was initially small but progressively increased in size, painless, and no other mass in any other part of her body. There was no history suggestive of malignancy and review of systems was normal. 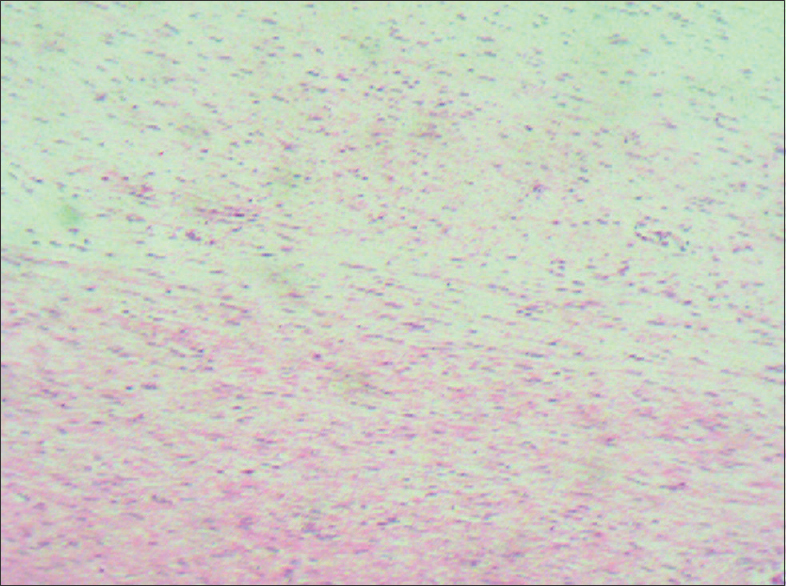 A mass was previously excised 3 years before presentation, but it gradually reappeared. 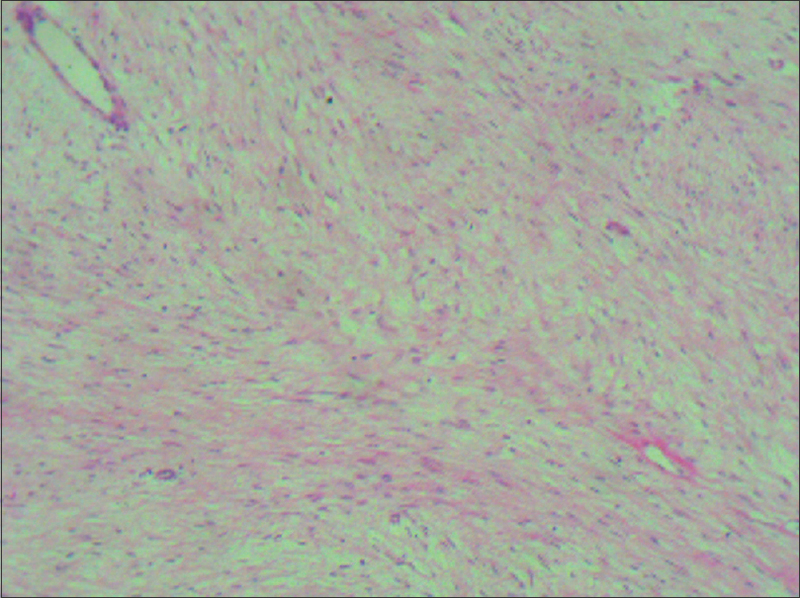 The histology of the mass was confirmed as desmoid tumor. Physical examination revealed a young lady, not pale, afebrile, anicteric, neither dehydrated with neither pedal edema nor peripheral lymph node enlargement. Abdominal examination showed an extended lower midline scar, transverse scar over a circumscribed mass, 20 cm × 20 cm, firm, smooth surface, nontender, unattached to skin/underlying structure, extraperitoneal, and no inguinal lymphadenopathy [Figure 1]. Other systems examination was normal. Full blood count showed hemoglobin of 11.9 g/dl (hematocrit = 33.2%), total white cell count of 4.8 × 10/mm 3 and platelet count of 253 × 10/mm 3. Electrolytes, urea and creatinine, random blood sugar, urinalysis, and chest X-ray were normal. Abdominal computed tomography (CT) scan showed a large oval well-defined heterogeneously enhancing isodense mass without calcifications measuring about (13.5 cm × 11.4 cm × 17.0 cm) arising from the medial aspects of the left anterior abdominal muscles (external oblique, internal oblique, transversus abdominis, and rectus abdominis muscles) with benign CT scan features located in the right lumbar and iliac regions [Figure 2]. She had complete excision of the tumor and there was no intraperitoneal involvement. 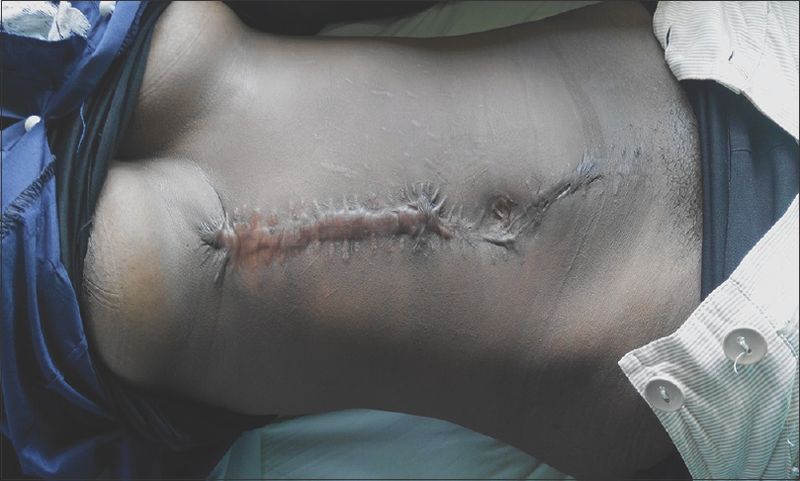 Abdominal fascia was closed with nonabsorbable suture without tension or need for mesh repair [Figure 3]. Tumor weighed 3 kg [Figure 4]. Histologic sections show a benign neoplasm composed of proliferating spindle-shaped cells with tapering nuclei and amphophilic cytoplasm. These are disposed within a myxoid background with focal collagenous areas. Some of the cells have wavy nuclei. Numerous ectatic blood vessels are seen. No mitotic figure is seen [Figure 5] and [Figure 6]. 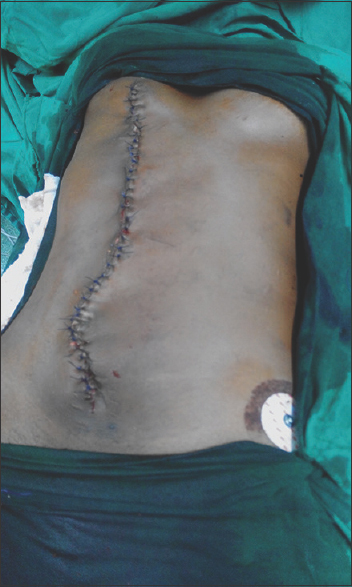 The abdominal wound healed with a hypertrophic scar after 6 months [Figure 7]. Desmoid tumors usually occur in young females who are in their reproductive ages, giving credence to a positive role of estrogen in the tumor growth. The case reported also occurred in a young female. Abdominal desmoid tumors occur sporadically or are associated with some inherited syndromes, such as FAP. The reported case may have occurred sporadically as there was nothing clinically to suggest FAP in the patient. Lefevre et al. reported that 37%–50% of desmoids tumors are initiated in the abdominal area which was similar to the location in the case we reported. This differs from the work of Duggal et al. that reported a higher number of desmoid tumors involvement of the lower limbs. Complete surgical excision followed by reconstruction of the defect is the mainstay of treatment of extra-abdominal desmoid tumors. This was the treatment carried out in the reported case with no local recurrence for over a 6-month duration. Other treatment modalities advocated with varying success rate include antiestrogens, chemotherapy, and radiotherapy. Depending on the tumor size, treatment received and negative resection margin, tumor recurrence occurs in up to 45% of cases. Leithner et al. reported that recurrence is independent of negative margins, however, Lahat et al. reported that incomplete tumor removal or involved excision margins may lead to local recurrence. Nuyttens et al. reported a local recurrence of 20.5% in a retrospective review of 151 patients who underwent a macroscopically complete resection of desmoid tumors while Kumar et al. reported a recurrence rate of 25% with the most important factor for recurrence being a tumor >5 cm. Gender, tumor size, margin status, location, and number of tumors are predictive factors for local recurrence. Following tumor excision, a reconstruction of the abdominal wall defect with Mesh may be necessary depending on the size of the defect. The reported case had closure of the abdominal fascia with nonabsorbable suture without tension; hence, Mesh repair was not necessary. The differential diagnoses of an anterior abdominal wall mass include acute hematoma, fibrosarcoma, lymphoma, rhabdomyosarcoma, liposarcoma, leiomyosarcoma, neurofibroma, benign fibrous tumor, and primitive neuroectodermal tumor. Tumor recurrence in desmoid tumor ranges from 19% to 77%. This necessitates the need for regular follow-up strategy to be adopted after treatment. The National Comprehensive Cancer Network's Soft Tissue Sarcoma guideline (version 2.2012) recommended history and physical examinations with appropriate imaging such as CT scan or magnetic resonance imaging every 3–6 months for 2–3 years, and then annually. This recommendation is what we have adopted in the follow-up of the reported case. Desmoid tumors of the anterior abdominal wall are rare tumors. Complete surgical excision prevents early tumor recurrence in this case. Abdominal closure using nonabsorbable suture without mesh may still be feasible in some cases with a large defect. Sakorafas GH, Nissotakiss C, Peros G. Abdominal desmoids tumors. Surg Oncol 2007;16:131-42. Eastley NC, Hennig IM, Esler CP, Ashford RU. Nationwide trends in the current management of desmoid (aggressive) fibromatosis. Clin Oncol (R Coll Radiol) 2015;27:362-8. Kasper B, Baumgarten C, Bonvalot S, Haas R, Haller F, Hohenberger P, et al. Management of sporadic desmoid-type fibromatosis: A European consensus approach based on patients' and professionals' expertise – A sarcoma patients EuroNet and European Organisation for Research and Treatment of Cancer/Soft Tissue and Bone Sarcoma Group initiative. Eur J Cancer 2015;51:127-36. Howard JH, Pollock RE. Intra-abdominal and abdominal wall desmoid fibromatosis. Oncol Ther 2016;4:57-72. Lips DJ, Barker N, Clevers H, Hennipman A. The role of APC and beta-catenin in the aetiology of aggressive fibromatosis (desmoid tumors). Eur J Surg Oncol 2009;35:3-10. Lefevre JH, Parc Y, Kernéis S, Goasguen N, Benis M, Parc R, et al. Risk factors for development of desmoid tumours in familial adenomatous polyposis. Br J Surg 2008;95:1136-9. Duggal A, Dickinson IC, Sommerville S, Gallie P. The management of extra-abdominal desmoid tumours. Int Orthop 2004;28:252-6. Teo HE, Peh WC, Shek TW. Desmoid tumor of the abdominal wall. Radiology 2005;236:81-4. Nuyttens JJ, Rust PF, Thomas CR Jr., Turrisi AT 3rd. Surgery versus radiation therapy for patients with aggressive fibromatosis or desmoid tumors: A comparative review of 22 articles. Cancer 2000;88:1517-23. Leithner A, Gapp M, Leithner K, Radl R, Krippl P, Beham A, et al. Margins in extra-abdominal desmoid tumors: A comparative analysis. J Surg Oncol 2004;86:152-6. National Comprehensive Cancer Network (NCCN) Clinical Practical Guidelines in Oncology: Soft Tissue Sarcoma. Fort Washington, PA: NCCN; 2012. Ver. 2.2012. [Current Version]. (Free registration required). Available from: http://:www.nccn.org/professional/physiciangls/pdf/sarcoma.pdf. [Last accessed on 2014 Jun 15].